Bible 200 contains well-written stories from the Old Testament. They captivate the child’s imagination and bring the Bible to life. 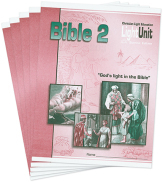 Each LightUnit has sixteen lessons, providing two or three Bible lessons a week for a whole school term. A lesson consists of two pages with a simple Bible story and a corresponding activity such as sequencing events, unlocking a coded message, color-by-number, or simple crossword puzzles. The Teacher’s Guide contains a more detailed version of each story for the teacher to tell or read. Without quizzes or tests, this course allows the child to enjoy the Bible and learn its truths without a heavy workload. Our goal is for Bible to be so enjoyable that the students look forward to every class. Answer keys are optional if the Teacher's Guide is purchased. Bible 300 introduces the student to the first four books of the New Testament. The first LightUnit is a story that acquaints students with Jewish culture and customs during the time of Christ. The remainder of the course is a study of the Gospels that will continue into fourth grade. 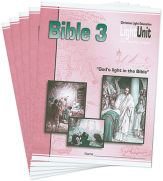 Each lesson contains an interesting story from Jesus’ life and workbook activities. Each LightUnit has two quizzes and a test. By doing two or three lessons per week, this course will cover the entire school year. The Teacher’s Guide gives objectives and suggestions for teaching each lesson and provides alternate LightUnit tests for students who need to make up for a failing test score. Reproductions of all the LightUnit pages, quizzes, and tests are included with the answers filled in. Answer keys are optional if the Teacher's Guide is purchased. Bible 400 expands the study of the Gospels started in the third grade. The first LightUnit contains fictional stories that acquaint students with the worship, customs, and daily activities of Jews during the time of Christ. LightUnits 402 through 405 focus on Christ’s earthly ministry, His teachings, and His death and resurrection. 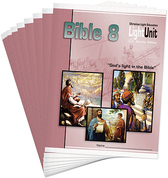 Each LightUnit has twelve lessons containing an interesting story and workbook activities. Each LightUnit also has two quizzes and a test. By doing two or three lessons per week, this course will cover the entire school year. The Teacher’s Guide gives objectives and suggestions for teaching each lesson and provides alternate LightUnit tests for students who need to make up for a failing test score. Reproductions of all the LightUnit activities, quizzes, and tests with the answers are included. Separate answer keys are not required if the Teacher’s Guide is purchased. This latest addition to our new Sunrise Bible program begins a study of the Old Testament, starting with Creation and ending with the life of Moses. 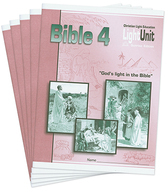 Each lesson contains a well-written Bible story followed by workbook activities. Map exercises help students understand the geography corresponding to the lessons. 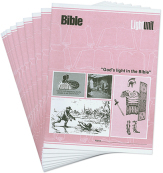 The Teacher's Guide contains reproductions of the LightUnit pages with answers filled in. Sunrise Bible 600 picks up the study of the Old Testament where Bible 500 ended. It begins with Joshua and the crossing of the Jordan and closes with the return from the Captivity and looks forward to the coming Messiah. 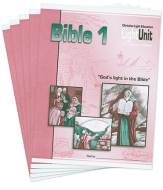 Each lesson contains a well-written Bible story and includes workbook activities. In the later LightUnits of the course, students begin reading from the KJV Bible as a part of their lesson text. Map exercises show the geography of the different periods covered. 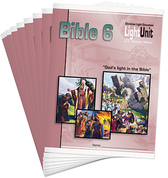 Bible 600 has ten LightUnits with 16 lessons in each including the two quizzes and a test. This provides for one lesson per day for one school year. The Teacher’s Guides give objectives and suggestions for teaching each lesson, provides alternate tests, and include LightUnit pages complete with answers to all activities. Sunrise Bible 700 is a study of the Gospels. 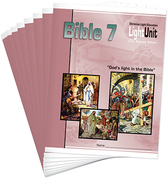 The first LightUnit begins witha brief overview of each Gospel’s unique characteristics. Lessons in the rest of the course follow the chronological order of the Gospel of Luke but include events and teachings from the other Gospels. Each lesson directs the student to read a given portion of Scripture. This Scripture passage is then explained in the LightUnit and followed by activities that help the student interact with what they have learned. The course also teaches students how to use Strong’s Concordance. Bible memory work is included. The concordance work in this course uses Strong's Exhaustive Bible Concordance. Most versions, including electronic copies, should work well. However, if you use The Strongest Strong's Exhaustive Concordance, you will find some answers different from those given in our answer key. Sunrise Bible 800 continues the study of the New Testament begun in Bible 700. 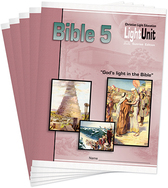 The first four LightUnits cover events in the Book of Acts, and the remaining LightUnits contain brief overviews of the epistles and Revelation. Each lesson directs the student to read a given portion of Scripture. This Scripture passage is then explained in the LightUnit and followed by activities that help the student interact with what they have learned. The course includes exercises using Strong's Concordance and teaches students how to use Baker’s Bible Atlas. Bible memory work is included. 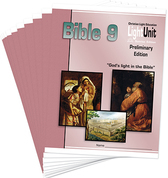 Bible 800 has ten LightUnits with 16 lessons in each, including two quizzes and a test. This provides for one lesson per day for one school year. The Teacher's Guides include teacher meditations, lists of lesson emphases, and suggestions for presenting and discussing the lessons. The Teacher's Guides contain the LightUnit pages complete with activity answers and alternate tests. The theme of Sunrise Bible 900 is Christ in the Old Testament. As students follow Old Testament events, they catch glimpses of Christ and gain deeper insights. Each lesson directs the student to read portions of Scripture. Explanations and activities help the student interact with what they read. This course includes exercises using Strong's Concordance and Baker's Bible Atlas. Each LightUnit includes a self test for each section and a LightUnit test, and should be completed in about three weeks for a full year’s study.